Bored of scrolling past updates about your old roommate’s cousin’s new baby or weird tirades from your crazy uncle? Delete your Facebook and check out Defender Journeys, a site Land Rover set up for owners to share off-road adventure stories. 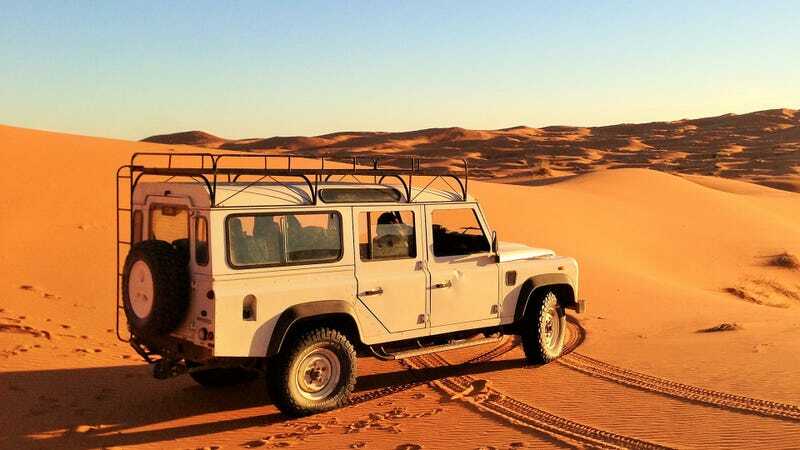 The site went live in January, but it’s a little more interesting now that some 400 Defender owners have added their stories and photos to the database. Normally when automakers try and do this the results are lame, but this is an incredible user-driven database of adventures in one of the greatest trucks ever built. And it’s quite addictive. The site basically starts you with a zoomed-out world map, from which you can click little pin-drops which shows you at least a picture of a real owner’s Defender and a maproute of a trip they took. For example, some of the more badass uploads are Alex Strohl’s France-to-Norway run, Land Rover’s factory-sponsored expedition from England to “the coldest place in the Northern Hemisphere, Oymyakon, northern Russia,” and this killer picture of Bear Grylls driving a completely battle-beat Defender in South Africa. These are fun to flip through even if you have no intention of getting off your couch, but they just might inspire you to spend way too much money on a truck. Now I’m fired up to get my Scout fired up all over again.